The first tip is to stay prepared. This may seem obvious, but you would be surprised by how many people find themselves in a situation where they are unprepared for the weather conditions. We recommend that you keep an ice scraper handy in your vehicle. As you already know, the weather is unpredictable and snow and ice can occur in months you might not expect it to. Another tip is to keep an emergency kit with warm clothing inside of your vehicle just in case you do find yourself in an accident that renders your vehicle unusable. Staying warm is important and you should not rely on your vehicle’s heating system alone. Make sure that you stay up to date on routine car maintenance like tire rotations and oil changes as well so your vehicle is equipped to handle harsh weather. Our auto repair experts at International Autos Body Shop near Milwaukee recommend that you drive with caution. Make sure that you give yourself enough time to break if the roads are icy. 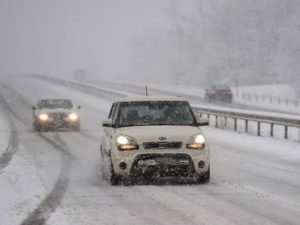 Drive slowly if there is heavy snowfall or if the roads are slippery, icy, or unplowed. Avoid stopping or accelerating too quickly, as this can cause your vehicle to spin out or slide, which is hazardous to both you and surrounding drivers. Pay attention to your surroundings and never drive while under the influence or sleep deprived. Most importantly, never take risks during dangerous winter weather. If possible, stay home during winter storms. If you do not have to go out on the road, DON’T! Snow and ice are unpredictable, even for the most reliable vehicles and experienced drivers. Unfortunately, even if you do implement these winter safety tips, getting into an accident is still a possibility. If this ever happens, International Autos Body Shop in West Allis will cover all of your repair needs. Our top-quality body shop technicians will get you back on the road as soon as possible. For a detailed list of the services we offer, please find more information here. To schedule an online appointment, please fill out a service request form today! We look forward to hearing from you and providing excellent customer service.